Along with featuring two Brand New trainers for players to select from to journey through the Kanto Region with, Pokemon: Let's Go, Eevee also introduces a New Rival never seen before in the Pokemon Franchise. Outside of what this Rival looks like, there is really not much known about him. 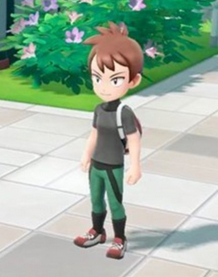 There has yet to be any indication on what his personality might look like, as well as what Pokemon he will have.